Like many other highly industrialised nations, France has sought to solve its desperate housing problems by making use of prefabricated structures, in steel as well as in other constructional media. For this purpose various consortia have been established; one of them consisting of architects and industrialists, which was formed in 1962, is known as GEAI (Groupement pour l’Etude d’une Architecture Industrialisée). 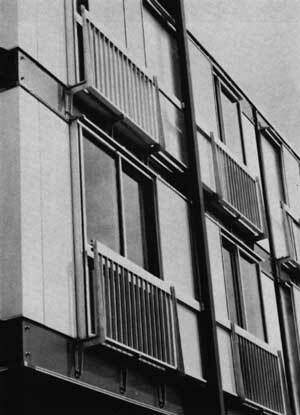 As a result of their investigations, GEAI were able to construct a prototype block of flats in Aubervillers early in 1966, the principal virtue of which was that a completely dry system of construction was involved above the foundations. Subsequently, a scheme for 500 flats, consisting of 25 blocks of 20 dwellings, was prepared for a site in Rouen, the scheme being known as ‘Grand’Mare III’. It is the object of this article to describe the salient features of this project which is now rapidly nearing completion and has been the subject of a recent visit by representatives of the European Convention of Constructional Steelwork Associations, including the BCSA. As will be observed from the accompanying photographs, the elements erected on the site are comparatively few in number. The loads are carried by steel columns and an unusual floor and roofing system comprising components which are reminiscent of mattresses. These mattresses consist of three-dimensional latticed frames, 300 mm deep, formed into panels based on a 900 mm square module, typical sizes on plan being 3.600 m × 2.700 m, 4.500 m × 2.700 m and 5.400 m × 2.700 m. Within the blocks there are steel staircases, but provision could be made for lifts. The floors comprise thin concrete slabs and the ceilings, interlocking chipboard panels. Dry partitions, either permanent or temporary, are used, together with prefabricated wall panels, balcony balustrading, joinery and blinds. It is interesting to note that all the main elements have been subjected to fire tests, with completely satisfactory results. The most original item in the GEAI system is undoubtedly the floor mattress. As will be seen in the photographs taken in the fabrication shops in Rouen, the standard panels comprise top and bottom grids, made from 10 mm round bars at 300 mm centres in both directions.. These grids are staggered by 150 mm in both directions with respect to one another in order to accommodate the 8 mm lacing bars providing the infilling. The main framework around the mattress consists of four lattice girders comprising angle chords and flat web members. All the units are interchangeable as they are accurately fabricated in jigs. There are also special panels to allow for the passage of vertical ducts, etc. A particular feature in the Grand’Mare III scheme is that the exposed steelwork is in Cor-ten weathering steel. To prevent any possible staining in the early stages of oxidation, the columns are offset from the façades by the insertion of special brackets. The scheme occupies two adjacent sites where provision has been made for 100 three-room flats, 312 four-room flats and 88 five-room flats. The twenty-five blocks are all five storeys high, the ground floor of each being limited to the entrance hall, a perambulator area, a dustbin store and the central heating unit. Nine blocks are isolated but the others are in groups of two or four. Despite the fact that the weight of the GEAI structures is about one-quarter of that of traditional buildings of the same volume and for similar purposes, it was necessary to employ some piled foundations as the sub-soil conditions were not good. There are eight driven piles per block, 35 concrete bases and a lean-mix slab for the enclosed portions of the ground floor. 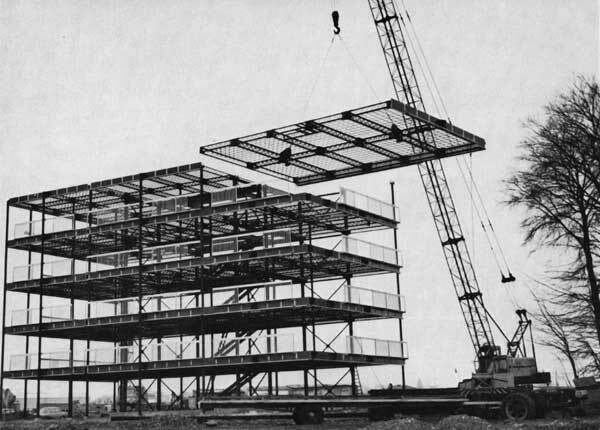 Apart from pile-driving equipment, the only vehicles on the site were lorries which delivered the components and mobile cranes which erected them. Once the foundations and bases for a block of flats had been completed. It was possible to start erection. To ensure stability, braced panels are incorporated in the design as strong points. These units, consisting of two 180 mm deep column sections, 15 m high and spaced at 3.600 m centres, braced with channels and angles and completely fabricated in the shops, were the first components to be erected on the site where they were held in position in temporary guys until sufficient steelwork had been erected to make the structure stable in all directions. The central parts of the blocks are reserved for vertical circulation and for the landings serving the flats. 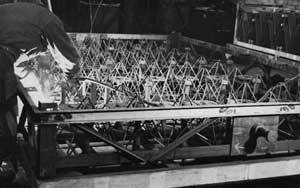 The landings and the corresponding portions of the roof were made from 5 mm thick plate and light joists. This steelwork, which was shot-blasted and painted, together with the staircase steel, was the only steelwork not in Cor-ten. On the site, the various mattresses were bolted edge-to-edge to make up the very large floor units which were hoisted by mobile crane as shown in the illustration. Once the steelwork had been erected it was possible to fix the partitions and cladding extremely quickly. In fact, the whole operation could proceed almost independently of the weather. The architect responsible for the conception and development of the GEAI system is Marcel Lods. The BCSA also gratefully acknowledge the help given by the Compagnie Française d’Entreprises Métalliques (CFEA) who kindly supplied the photographs.